I stared at my lone skinny bathroom shelf. Then I stared at my piles of make-up, my growing collection of body splashes, my bath powder, my lotions, my shampoos and conditioners, my tooth brushes, my this and that and the other thing totaling pretty much a ton of beauty paraphernalia. How was I going to squeeze all that stuff onto that narrow, rinky-dink shelf? Straw baskets to the rescue. At Goodwill for a few dollars I found a straw napkin holder with its’ original label still attached. Next I foraged around for some thrift shop glass containers to separate my different make-ups, brushes, emery boards, nail clips, etc. For my lipsticks I found a circular shallow container. Encased within that, I placed a curved taller glass to hold my make-up pencils and brushes. For my toothbrushes I dug up an unusually shaped, slender glass that wouldn’t tip over from the weight of the brushes. My tortoise shell hairpins were a tougher proposition; no glass was tiny enough to suitably contain them – till I spotted a shot glass at the back of my kitchen cupboard. Perfect. 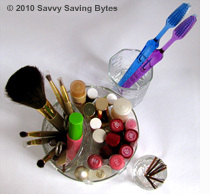 With all my make-up and application tools now visible and easy to reach, I had myself an organized make-up station. In a more commodious straw basket that had originally arrived with a flower arrangement, I gathered all my taller beauty aids: bath powder, cotton balls (stuffed into in a vinaigrette jar because of its apt size and shape), tanning lotion, scissors (I always seem to be chopping away at hair that grows faster than weeds) and a large magnifying mirror (for make-up application, not god-forbid, examining skin magnified a creepy five times large than life). Next I attacked my bath toiletries. For them, I located a long slim basket to take up permanent residence on the corner rim of my bathtub. Into it went my shampoos: one really good one, one cheap one to use in between the “good” applications, an anti-dandruff one and one that removed harsh red tinges from my hair stylist’s occasionally over-zealous, blonde highlighting. This basket also contains hair conditioners and pumice stone, all easily reachable during bath time. Another plus: it’s impervious to shattering on the hard surface of tub or tile floor. Straw baskets last a surprisingly long time. But they’re thirsty little devils and need a solid drenching every so often to keep their fibers tough and supple. 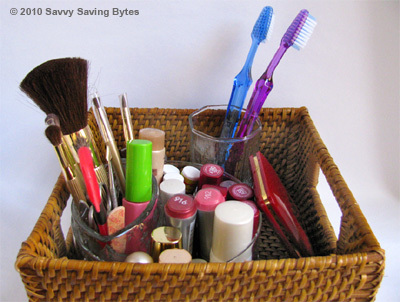 So if your collection of bath and beauty aids belongs in a king-size bathroom instead of the doghouse size you actually have, consider organizing and containing it with versatile, easy on the wallet, straw baskets.